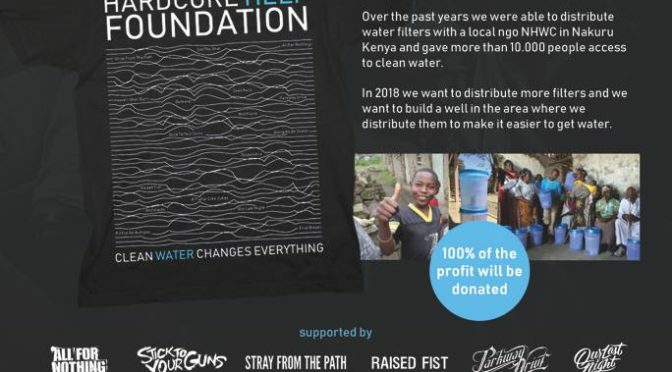 It’s exactly 1 year ago that we released this campaign to raise awareness about clean water and to collect donations for our water filter project in Kenya. In one year we sold 851 clean water shirts! This is something we never expected. So awesome. In February we’ll proceed again with the next distributions. These take time and are combined with a workshop, the past two months a certificate had to be renewed. Everything has been sorted out again. New distributions with our local partner The Nathan Hall Williams Center are planned within the next weeks. We can’t say this enough: thanks for supporting this project, shout out to all the bands and partners.